The SECULIFE | ESBASE (Germany) is an easy-to-use power meter for testing high frequency generators used in the field of HF surgery. Measured values are indicated at a large analog display. The display’s color coded scale makes it easy to read the measurement results. The SECULIFE | ESBASE (Germany) works without any external power supply and without batteries. Two selectable current ranges are available: 0 to 1500 mA and 0 to 3000 mA. The SECULIFE | ESBASE (Germany) has been equipped with 6 different load resistors for the 1500 mA range (50, 75, 100, 200, 300 and 500 Ω). A 50 Ω load resistor is used in the 3000 mA range. boasts a measuring uncertainty of just 1%. Acquisition, saving and printing of waveforms read out by ESU generators with up to 32,768 data points by means of special computer software. With its unprecedented features, the SECULIFE | ESXTRA / ESPRIME (Germany) has attained to entirely new standards for electrosurgical analyzers with comprehensive functionality. It offers an unparalleled range of applications and features – all in a single, self-contained electrosurgical analyzer. Thanks to the use of internal, induction-free high-precision test loads ranging from 0 Ω to 6400 Ω in previously unavailable 1 Ω steps, the SECULIFE | ESXTRA / ESPRIME (Germany) offers the required compatibility for hospitals as well as for manufacturers. For all eventualities, an option has been provided for adding an external load which assures 100% compatibility with test load requirements during the years to come. 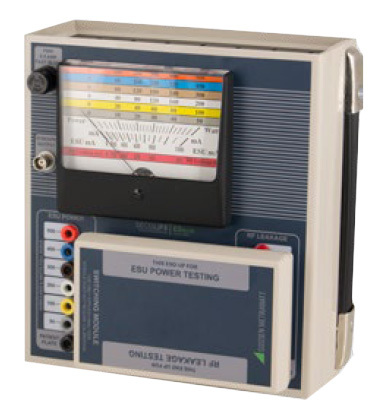 With an HF current range of 2 to 7000 mA RMS (power range of 500 W RMS), the SECULIFE | ESXTRA / ESPRIME (Germany) surpasses all currently and previously available analyzers where measuring range is concerned. The accuracy of the new analyzer, which approaches calibration quality, overcomes previous obstacles which thwarted other analyzers that boasted comprehensive functionality. The SECULIFE | ESXTRA / ESPRIME (Germany) makes it possible for the user to execute mobile test sequences and calibration procedures with unequaled precision and accuracy, even for the newest generators offered by leading manufacturers. Functions like automated power/load curve tests with multiple power steps per load setting and automated, user-defined test sequences with an unlimited number of steps, each of which can be furnished with nearly unrestricted ASCII text descriptions, have also contributed to catapulting the SECULIFE | ESXTRA / ESPRIME into a class of its own. It’s even possible to individually program an automated test report for REM/ARM/CQM tests and/or HF leakage current measurements. 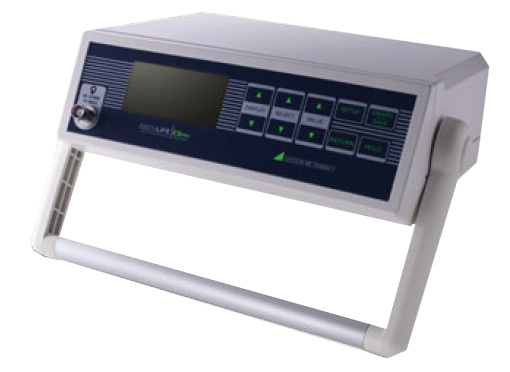 Use of state-of-the-art technology makes strict adherence to the standards of the electrosurgical industry possible through the performance of HF current measurements (instead of voltage measurements). This not only applies to measurements for conventional generators with “continuous” waveform output, but rather for generators with “pulsed” output as well. The new SECULIFE | ESXTRA / ESPRIME (Germany) is in a class of its own, and its real-time operating system provides for nearly unlimited expansion options for future tasks. This makes it the logical choice of customers who are looking for an analyzer with comprehensive functionality. As compared with the SECULIFE | ESXTRA / ESPRIME (Germany) , the high sampling rate of the SECULIFE | ESXTRA / ESPRIME (Germany) enables measurement and analysis of pulsed waveforms with up to three different amplitudes.